Blazer by BASLER in slightly shorter cut. 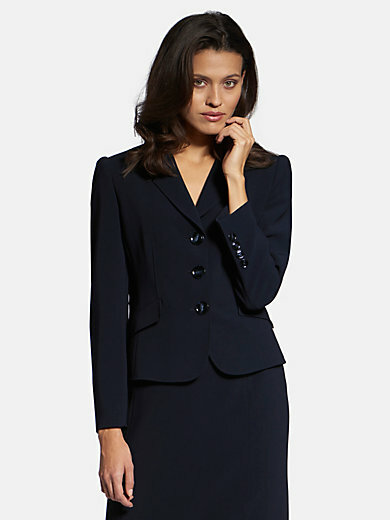 Feminine, slightly tailored fit with revere collar, flap pockets and pleated detail at the elaborately fashioned back. he low-crease woven fabric has a pretty drape, exudes dignity and offers a high degree of comfort. Made of 70% triacetate, 30% polyester.Lining made of 100% acetate. Length approx. 22ins. The blazer should be dry cleaned.